Historically, improvements in GPU-based high performance computing have been tightly coupled to transistor scaling. As Moore's law slows down, and the number of transistors per die no longer grows at historical rates, the performance curve of single monolithic GPUs will ultimately plateau. However, the need for higher performing GPUs continues to exist in many domains. To address this need, in this paper we demonstrate that package-level integration of multiple GPU modules to build larger logical GPUs can enable continuous performance scaling beyond Moore's law. 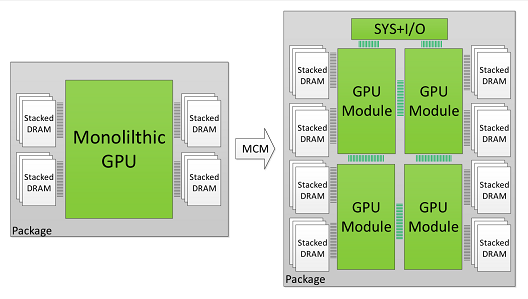 Specifically, we propose partitioning GPUs into easily manufacturable basic GPU Modules (GPMs), and integrating them on package using high bandwidth and power efficient signaling technologies. We lay out the details and evaluate the feasibility of a basic Multi-Chip-Module GPU (MCM-GPU) design. We then propose three architectural optimizations that significantly improve GPM data locality and minimize the sensitivity on inter-GPM bandwidth. Our evaluation shows that the optimized MCM-GPU achieves 22.8% speedup and 5x inter-GPM bandwidth reduction when compared to the basic MCM-GPU architecture. Most importantly, the optimized MCM-GPU design is 45.5% faster than the largest implementable monolithic GPU, and performs within 10% of a hypothetical (and unbuildable) monolithic GPU. Lastly we show that our optimized MCM-GPU is 26.8% faster than an equally equipped Multi-GPU system with the same total number of SMs and DRAM bandwidth.